We’ll get an update on Jean-Francois Leroch as soon as we can (but we know he didn’t break anything, ‘just’ a very nasty flesh wound), but Chamberlain-Synergy driver Peter Owen is OK too: no broken leg, just a good shaking / bruising from hitting the wall on the right, coming down the hill out of La Source. Now we know he’s OK, we can use these images (below). 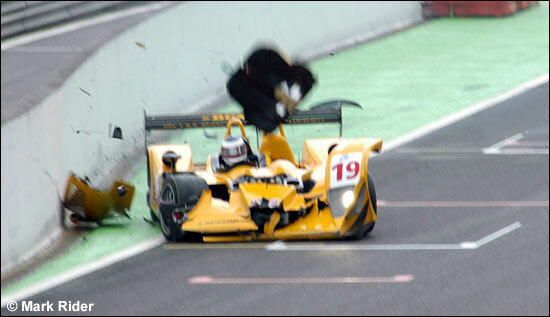 The crashbox on the Lola B06/10 did its job perfectly, and the impact with the barrier on the left was a minor one. The Chamberlain-Synergy team had actually led lap 2 of the 1000 Km: what could have been an inspired move – bringing Bob Berridge in, under the safety car, to switch to Peter Owen – then turning sour once the race re-started again. But it was more complicated than that…. As we pointed out at the time, in our live race coverage, Bob Berridge actually led the race at the end of lap 2, because he’d come through both pit lanes at 60 kph, which was considerably faster than the safety car’s speed. Peter Owen then took over, at the back of the pack, having been held at the pit exit until the pack had passed (we initially thought he’d been let out ahead of the pack and had gained a lap – he hadn’t). 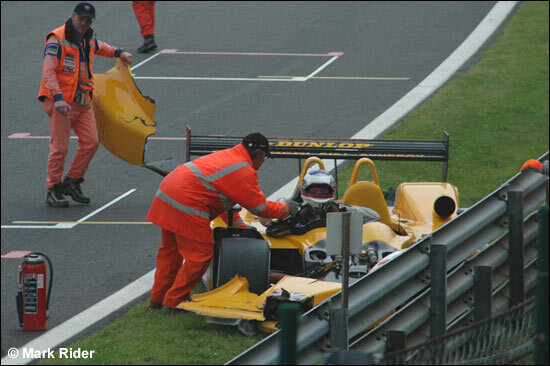 The field was stopped on the pit straight completing lap 3, and poor Peter Owen had his accident completing lap 4, the first of the two, new ‘warm-up’ laps. Peter Owen is back at work already, and in meetings today, but Gareth Evans and Bob Berridge help explain what happened. Gareth Evans: “Peter was trying to get some heat into the tyres, and he just got caught out by cold tyres and the damp track. “Peter’s son was with us in the pits, so I walked up the hill to find out how Peter was. I must admit I was very concerned at what I saw. Peter was being lifted out of the car, he had his arms and legs bound up – and his eyes closed. “I asked the doctor how he was and was told that Peter was complaining of pains in his leg, so before he was out of the car, the doctor thought he might have had a broken leg from the frontal impact. 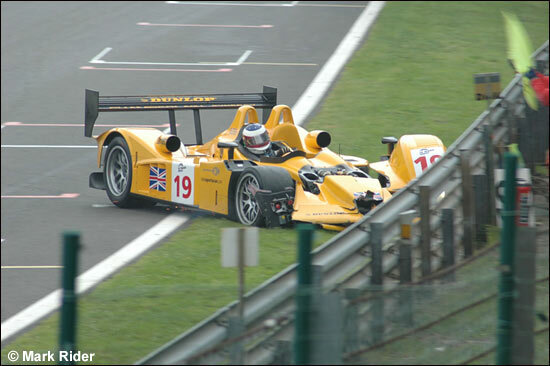 So with Peter Owen pronounced fit and now back at work (with some bruising to his chest as his only fresh injury), it was a relieved Chamberlain-Synergy team that left Spa – but a desperately disappointed one too (although the sister car did win LMP2 – again). 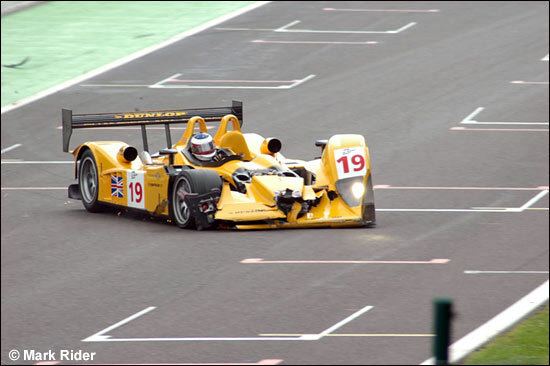 Next stop for the 2005 Le Mans Series championship-winning team is the Le Mans test day – after a sizeable rebuild job on the B06/10. g/ No refuelling is allowed, except for cars which were already in the pit lane when the red flag was displayed. The organisers actually created “parc ferme conditions” on the new grid (in contradiction of f/ above – although at least one team was allowed to tape up bodywork for safety reasons), and teams weren’t allowed to change tyres or warm their tyres, or check the cars over, despite the fact that the field had been ushered through the debris field at the top of Eau Rouge. The time spent on the grid was announced as part of the race duration (six hours) so at least two significant teams had their drivers penalised for spending too long at the wheel (in contradiction of c/ above).